He built up his route from nothing and as of Feb. 28, Bud Wendroth will retire after 42 and a half years with Oak Grove Dairy. The era of home milk delivery in the Paynesville area will come to an end. “When I came to town, there was no route lined up...no stores, no houses to stop at, not even a truck. My supervisor and I went house to house knocking on doors for two weeks to see if anybody would be interested in having home milk delivery,” Wendroth said. After they had a few home owners agreeing to milk delivery, Wendroth was given a panel truck to drive. The dairy supplies were stored at Nehring Locker and the truck was kept at Dot and Rays. Wendroth said he worked at the Eden Valley Creamery for a few months, then at the St. Peter Creamery a year and a half before entering the army. After his discharge from the army, Wendroth worked at the Eden Valley Creamery for three to four months before going to work with Oak Grove Dairy, based out of Norwood-Young America. “My mother-in-law saw an ad in the newspaper for a route driver and passed the ad onto me,” Wendroth said. Wendroth built up his route to about 350 customers. He delivered dairy products from Belgrade to Kimball and everything in between. From the south side of Rice Lake and everything around Lake Koronis. “I worked 12 to 17-hour days. In 1970, I dropped Eden Valley and Watkins so I could be home earlier to watch my boys, Lyle, Loren, and Larry play basketball. My days started at 4 a.m. and I wasn’t home until 9 p.m. most days. Today, his route consists mostly of Hawick, Regal, Roscoe, and Paynesville with between 130 to 150 homes in the Paynesville/Lake Koronis area. His work day consists of six to seven hours. He doesn’t work on Wednesdays any more. On the first of March, trucks out of St. Cloud will start making deliveries to convenience stores and restaurants. Semi-trucks have been making the deliveries to the grocery stores since Feb. 1. 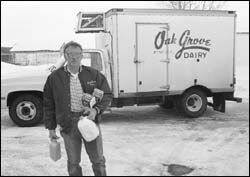 Oak Grove delivers dairy products to Wendroth three times a week. Wendroth states his customers consume between 700 and 800 cases per week. Each case holds nine half gallon cartons of milk or orange juice. “We deliver everything in the dairy line which includes milk, orange juice, half and half, tator topping, and ice cream,” Wendroth said. Each morning Wendroth loads up his delivery truck and heads to the stores. Then he heads home and reloads before doing his home delivery route. “I reload the truck four to five times a day,” he said. “When I started, I didn’t have a refrigerated truck. I covered everything with cardboard and canvas to keep things from getting too warm and the ice cream from melting. Now the trucks have freezer plates which holds the products for a good 10 hours,” Wendroth said. Leola teases him about the time he fixed Sue Voss’ washer. “Bud didn’t just deliver milk to homes, he was also a fix- it man for some,” she said. Bud and Leola have five children: Lynn, Lyle, Loren, Larry, and LeAnn. They have all helped on the milk route while they were growing up. Wendroth enjoyed the work and the people on his route. “I appreciate the loyalities and friendships of my customers over the years,” he added.